Information on what screen versions are and how they work. Versioning is a vital feature when it comes to creating screens. Once you’ve created a screen and it’s been live for some time, you may want to make changes to it, but you might not want to take the whole app offline to make your changes. That’s where screen versions comes in. 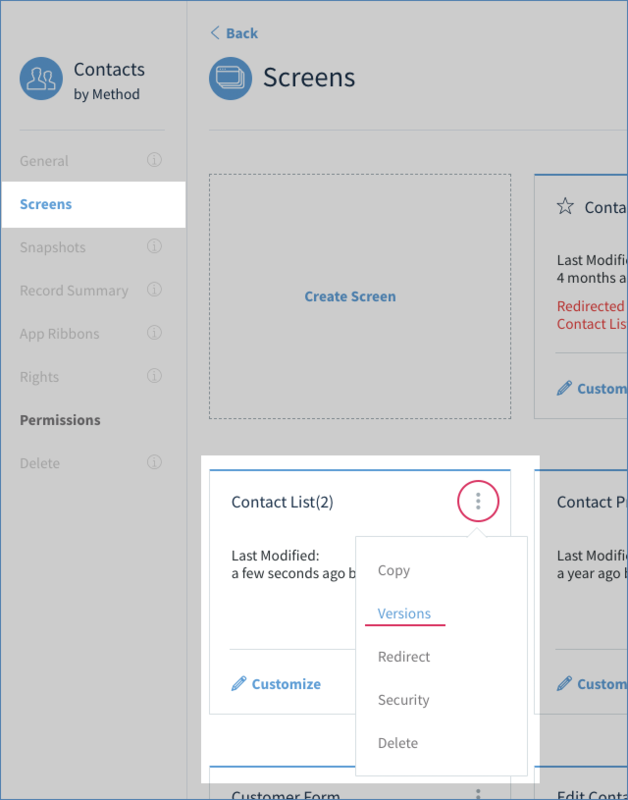 This feature lets you create a new version of a particular screen and tweak it to your heart’s content, while keeping the original version live and in use by other users. That way you don’t have to take the whole thing down, and nobody will be able to see your changes until you’re finished. 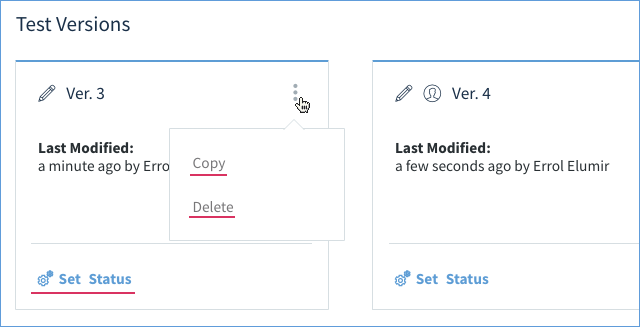 When you’re all done making your changes, you can “set it Live for all users”, which is a Method way of saying you will have your users use your new version. If you aren’t happy with the changes, you can always revert and make the previous version live, since Method doesn’t replace one with the other; it just swaps them out and keeps the other in reserve. In order to access a screen's versions, you need to do this from the Manage Link on the App. 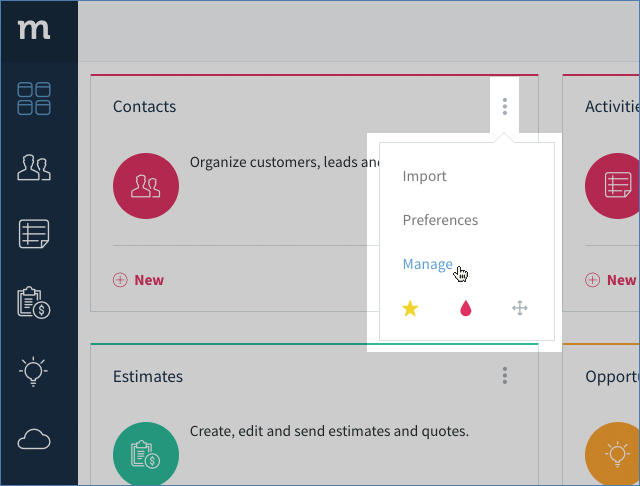 In the below example, we want to access the versions of a screen inside the Contacts App, so we are going to manage the Contacts App. Once in the Screen Management of the app, select the vertical ellipsis ( ⋮ ) of the screen you wish to access the versions of, and select Versions. There are a few things to note about versions here. Versions are on a screen basis, not an app basis. You cannot create a version for the entire app. You cannot edit the versions of a stock screen since you are never allowed to make edits to any stock screen in Method. Thus, in the above example, we are accessing the versions of a copied stock screen. A version is different than a copy of a screen. When you click on the Versions option in any screen, you’ll be taken to the Version Manager, which shows you what versions exist for this screen. As you can see, each version has a unique number (assigned sequentially) and a name and time/date tag identifying who last modified the version and when. 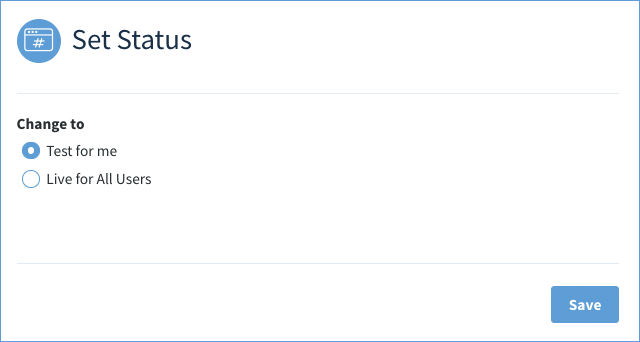 Set Status - sets a version to be Live, Test, or Archived. This is explained below. Copy (from the vertical ellipsis ⋮ menu) - make a duplicate of the version. It will be given the next sequential version number (so if you’re making a copy of Version 1, the copy will be called Version 2). This new version will be a Test version (see below). Delete (from the vertical ellipsis ⋮ menu) - delete the version entirely. This cannot be undone. You are unable to delete the Live Version. If a version is live, it means that this version of the screen is the one all users of the app use and interact with. There can only be one live version of a screen at any time, and it can’t be edited or deleted. When you first create a screen, no versions are in live mode. This is fine if only you are using the app, but once other users are using the app, you need to make a version live. This is especially true for Public and Guest pages. They must have a live version before they can be used by the public. In order to have a live version for a screen, you need to convert a test or archived version via Set Status. This will give you the option to make the version "Live for All Users". Test versions are not seen by a Method User, unless the user sets themselves to use a test version instead of the live version. By default, a user will see a live version of the screen if there is a live version. If a user wants to work on a test version, they would need to select Set Status on the version they wish to use, and then change it to "Test for me". When the user navigates to the screen within Method, they will see the test version, and not the live version. Furthermore, this allows the user to customize the screen without interfering with those who are using the live version of the screen. As we said above, when you use a test version, other users are still seeing the live version of the screen. Each user can only have one active test version of a screen at any time. 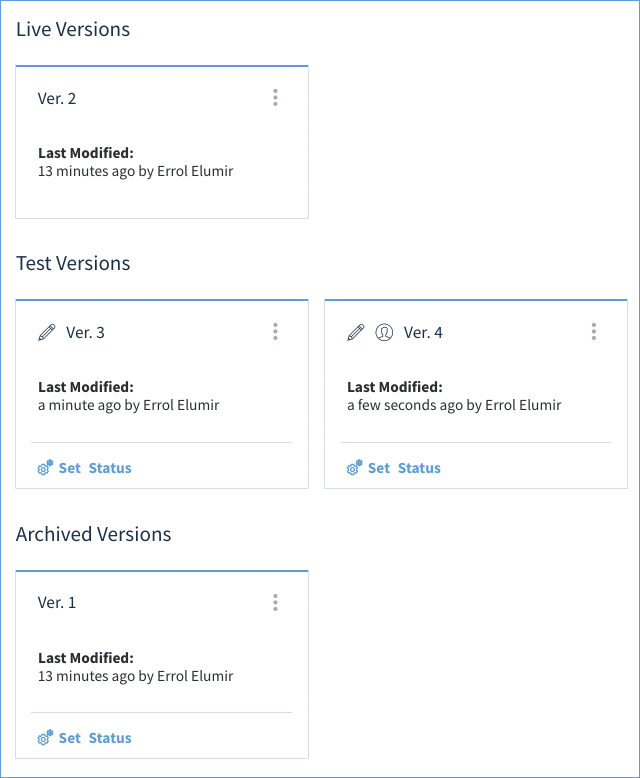 Considering there can be multiple test versions, how do you know which version you are looking at? There is a person icon indicating so. In the above image, do you see the little person icon? This indicates which test version you are using. If no test version has this person icon, then you are using the live version, the default version. As for the pencil icon, that means the version can be edited. Note that the live version and the archive version does not have a pencil icon, and thus cannot be edited. The final status for a version is the archive version. A version is automatically set to archived if it used to be live and was replaced by a different version. Although you cannot edit an archive version, you can delete it.